When sweetening your foods, there are natural sugar substitutes that are much healthier than sugar. Plus, they also give you more benefits. However, it’s important to always look for organic versions, not refined ones. More and more of us are on the lookout for healthy, natural sugar substitutes. After all, consuming too much refined sugar is one of the factors related to the development of metabolic and coronary problems. The food industry has tried to hide these effects for many decades. However, current studies show how dangerous it can be to your whole body. While it’s delicious and an inevitable part of millions of people’s diets, its presence in your body can cause severe imbalances. The most unsettling thing is that it’s highly addictive. Plus, it’s present in a wide range of products that you eat on a daily basis. However, more and more people are worried about the negative effects that surround sugar consumption. Because of this, they’re taking measures to remove it from their diet as much as they can. The good news is that there are certain natural substitutes for this ingredient. In exchange for a few calories, the serve as a sweetener or several recipes. Coconut sugar is a natural product that has been used as a natural sweetener in the traditional Asian kitchen. Despite this, western countries have only known about this ingredient for a few years. Overall, it’s a healthier option than refined sugars. Its glycemic index is only 35. In addition, it gives you a significant amount of essential minerals that benefit your health. In fact, its levels of vitamin C are also rather high. They also contribute to getting the recommended daily amount your body needs. If that wasn’t enough, this is one of the most sustainable sweeteners in the world. Coconut sugar comes from a tree that is beneficial for the environment. Coconut palms repair the ground, they don’t need much water, and they produce more sugar per acre than sugar cane does. Yacon syrup is a natural sweetener that stands out due to its low glycemic index and its high content of essential minerals and nutrients. Eating it doesn’t interfere with your blood sugar levels. It also doesn’t affect your metabolism. All of this happens because it doesn’t have many calories. Contrary to what happens with traditional sugar, it works to promote weight loss and normalizes bowel movements. It has a sweet flavor and a thinner consistency than honey. Among other things, this stands out as a very effective prebiotic. Organic honey is one of the most well-known and widely used sugar substitutes in the world. Its high energy value stands out. Plus, it has essential nutrients and antibiotic compounds. However, it has a slightly high-calorie content. Nevertheless, it’s one of the best options for sweetening recipes. The reason for this is because honey doesn’t affect your metabolic functions. It even has hundreds of medicinal applications that you can benefit from. 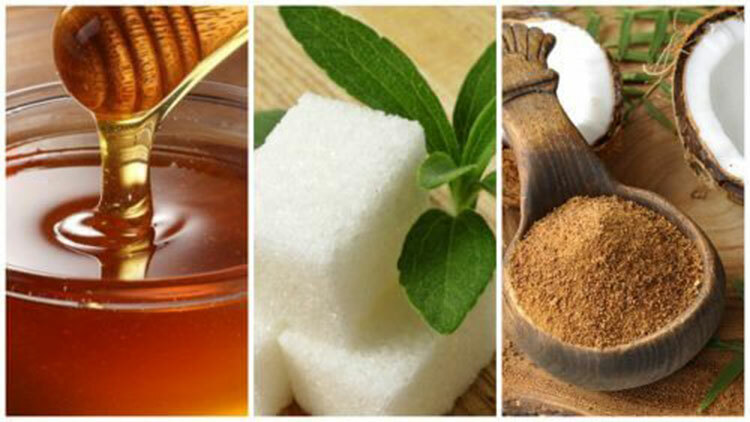 Honey prevents and treats many diseases. Stevia isn’t the most popular alternative sweetener on the market, but it is one of the sweetest and healthiest. Its ability to sweeten things surpasses traditional sugar by leaps and bounds. However, it doesn’t give you so many calories and it doesn’t elevate your blood sugar levels. In its natural state, it can be so sweet that many mix it with cellulose powder or other agents that make it easier to use. This natural product is native to Central America. In reality, it’s one of the most popular options for replacing refined sugar. This is because its glycemic index is only 30. Thus, it’s less than half of what traditional sugar has. This means that your body will digest it slower. Thanks to this, agave syrup doesn’t make you lose control of your blood sugar or cause high spikes. Instead, you start to feel a significant source of energy to achieve a good mental and physical performance. You can find two kinds in stores. However, the best is to choose the dark syrup because it’s less refined than the lighter syrup. It’s up to 25% sweeter than sugar and it’s used the same way as honey is used. Even though they’re not very well known, these natural sugar substitutes are the best option for sweetening your food without affecting your health. However, you need to keep in mind that all of these have low-quality versions. These versions can be mixed with sugar, corn syrup, and other chemicals that affect their properties. Always choose the 100% organic options, even though they cost a little more.